The 10th annual Lake Chapala Shrine Club (LCSC) Rib Fest was a resounding success, with more than 600 hungry diners turning out last Wednesday at the Cumbres Jardin de Eventos to tuck into Chef Tony Andalon’s sumptuous barbecue buffet. Aside from sending guests home with full tummies, the organizers have replenished their coffers for a noble cause. The Shriners operate 22 children’s hospitals across North America. Their mission is to provide free medical services in the areas of orthopedic, cleft lip and palate, burns and some hearing impediments. The Mexico City Shriners Hospital is the largest and busiest in the Shriner system. The facility’s medical staff currently attends an average of 5,000 patients under the age of 18 every month, including surgeries, treatments and rehabilitation. On the local front, the 50 members of the Lake Chapala Shrine Club work diligently to help children in need. Officers for 2016 are Bill Phillips, president; Harry Bublin, vice president; Bob Glenn, secretary; and Cesar Rubio, treasurer. Juan Márquez Flores serves as children’s committee chairperson. Youngsters in need of aid are referred to him, at telephone 766-3232. He then schedules Friday appointments with Dr. Alvaro González Urzúa, an orthopedic specialist at Clínica Máskaras who offers the organization screening consultations free of charge. 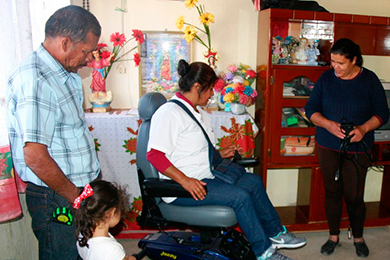 If the doctor’s evaluation indicates that the child’s care falls within the Shriner mission, he may order appropriate treatment available locally or in Mexico City. In any case, all related costs are absorbed by Lake Chapala Shriners. In addition to the annual Rib Fest, the Lake Chapala Shrine Club raises funds through private donations and the monthly Dine with the Shrine events. A different lakeside restaurant is showcased each month. The business contributes the price of its special menu towards patient treatment and transportation costs, keeping only tips and the tabs for salads, desserts and drinks.